Heal Your Puzzle » Blog Archive » Out of Body Experience? Here is introduction to your Out-of-Body Chakras. New to Chakras? Click here for an Introduction. 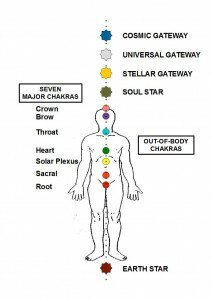 In brief here, the seven Major Body Chakras (see pic), which range in light frequency much like a rainbow from infra-red to ultra-violet, are spinning cones of subtle (quantum) and physical energies connecting you with your database of past experiences. Carl Jung described the Chakras as ‘Gateways to Consciousness’ and compared them with stages of psychological / spiritual development. In simple terms, when you think a thought or feel an emotion and decide on a course of action, you have decoded and interpreted subtle or quantum energy sensed from your surroundings. Your Body Chakras will have been activated to gather anything relevant from your past to give you meaning to your current situation and, as such, their development is fundamental for a healthy Mind and Body. Just working with the Major Chakras may not always solve a problem or illness however because they cannot access information held in your deeper consciousness although a ‘holding space’ may be created until you are able or wish to continue with your deeper therapeutic journey. This next step is where the Out-of-Body Chakras are needed to access the greater complexities of your Being. EARTH STAR This underpins your daily routines and supports your physical health; relates to feeling empowered and connected to the World. This is a prominent global challenge at this time as well as for us as individuals. SOUL STAR Here you access your karma – your unique record of your past (this life and inherited). At this Soul Level you choose what to bring into this life to experience again, to support you or to challenge you to grow. STELLAR GATEWAY Here your Higher Self offers higher guidance and wisdom to heal and educate You-as-a-Soul. It is reassuring as well to know that however much you develop yourself, there is always an even Higher Self offering guidance and support. UNIVERSAL GATEWAY The ‘I am’ Consciousness where you access the knowledge that ‘We are all One’ and are aware of Life as a very big picture where we all have roles in an infinite interconnected web of activity guided by a Higher Intention or Divine Will. COSMIC GATEWAY This is considered to be the bridge between the Human Experience and God, the Highest Divine, the highest expression of contentment and joy. Developing these Chakras brings greater wisdom but requires facing the reasons why access was lost in the first place, which can be an uncomfortable ride. Take strength in the Moment, connect with your Inner Axis, be inspired, for every journey there is a destination.